The uS03 microSOM solution ideal for applications requiring multimedia capabilities and/or high levels of parallel computing. The uS03 is designed for high reliability systems and for ensuring in rugged environments in addition to high performance, low power consumption, optimal MTBF for 24/7 systems working in extreme hostile conditions. The uS03 microSOM is very compact smart SOM and makes easier with great flexibility to design a new generation of Smart products, such as modern Human Interfaces, Smart IoT Controllers, Cloud edge interface with a very simple carrier board design. 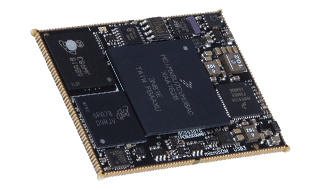 The microSOM includes Production ready Linux RT BSP / Android BSP and optionally Exor JMobile runtime designed for moderm IoT Server Controller / HMI /HTML5 Browser . The microSOM is smart and rugged solution , soldered directly into the main carrier board, without the use of expensive connectors that will reduce reliability of the system. With only 46x35mm and 4 mm height, microSOM allows you to design products extremely compact and ultra-slim. The microSOM requires a single supply of 3.3 V with very low power consumption. Powerfull Graphic Dedicated 2D Hardware accelerator, for applications requiring multimedia capabilities and high levels of parallel computing. 1 x LVDS Dual Channel or 2 x LVDS Single Channel 18 / 24 bit TFT interface. HDMI Interface 1.4 / Video Input Port / Camera Interface , LVDS interface , parallel LCD RGB interface , MIPI CSI and MIPI DSI Interface /Various video formats. JMobile / JMCLoud software platform, enable to design a User-friendly and high quality vectorial graphic (SVG) and HTML5 rich-graphical GUI, it assures a device connectivity with suite of +200 communication protocols and Cloud connectivity. Exor Product Longevity program ensures a stable supply of products. uS03 products are available for a minimum of 10 years from product launch.